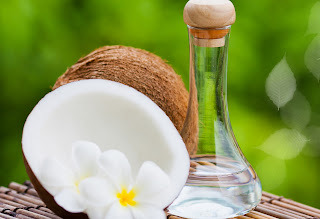 Coconut Oil is an all in one healthy oil! Its an anti-inflammatory, anti-microbial, anti-fungal, anti-viral and improves nutrient absorption as well! It can be used for cooking, as a lip balm, moisturizer, shaving cream, deep treatment conditioner, makeup remover,body scrub (mixed with sugar makes a great exfoliant),bug bites, athletes foot and canker sores. Its also been proven to boost metabolism and aid in digestion. It is also said to aid the memory with Alzheimer patients.